Last week we posted an article about how much money the large tech companies are making, but another really interesting thing to look at is how large their workforce is. Just as with revenues and profits, these numbers can be quite surprising (and impressive). We used the same group of 15 well-known tech companies that we looked at last week: Adobe, Amazon, Apple, Baidu, Cisco, Dell, eBay, Google, HP, IBM, Intel, Microsoft, Oracle, Sun and Yahoo. To put the size of the IBM workforce in perspective: IBM has more employees than Microsoft, Intel, Dell, Cisco, Apple, Amazon and Google all put together. Google and Amazon are almost exactly the same size in terms of employees. Microsoft has close to three times as many employees as Apple. IBM has almost 20 times as many employees as Google (or Amazon). 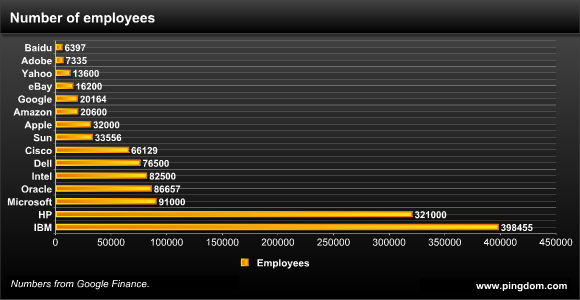 HP has more than four times as many employees as Dell. If you haven’t already, you might want to check out last week’s post about the money these companies pull in. All those employees and no coffee!!!! That’s crazy! So IBM could lay off 20k people (the size of Google) and it would still only be laying off 5 percent of its workforce? Wow. Working for a company that develops both hardware and software, I was recently astonished to find out how many people are working in hardware. We have about 4 people involved in software development (which is the core of our business) and QA. The hardware side involves over 20 people! We also only sell two hardware products, one is an OEM and we don’t really design any hardware for it, only firmware. Taking a look at the companies mentioned above… IBM and HP both provides huge numbers of hardware products. I also tend to consider IBM hardware and solutions to be a bit superior to HP hardware and solutions which may require more engineering to accomplish the higher quality. While Microsoft does have some hardware products, they are nothing like HP and IBM’s hardware portfolio and MS does not have enterprise hardware like both IBM and HP.